In April 1998, following years of success as a series, the Pokemon Company opened its very first Pokemon Center in Tokyo, Japan. Named after the service buildings in the Pokemon video games, the Pokemon Center is every fan’s dream come true: a specialty store of Pokemon plushies, keychains, game consoles, pins, stationary, clothing, bags, and rare, limited-edition merchandise. Today, seven additional Pokemon Centers have sprung up across Japan, with one store even going up overseas in New York (before later converting to a Nintendo World Store four years later). Getting a hold of Pokemon Center-exclusive merchandise can be a difficult—not to mention pricy—task, so let’s look at some of the best of what these Centers have to offer in order to expand your collection. 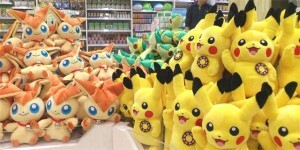 Plushies are among the most popular, rare merchandise offered by the Pokemon Center, and they come in several different varieties. “Standard Size” plush come in two different variations—Poke Doll and Poke Plush. While Poke Plush stand about 7in tall and look like miniature versions of your favorite Pokemon, Poke Dolls are slightly smaller (about 5in tall) and take on a cutesy, chibi look. Popular Poke Dolls include Slyveon, Fennekin, and Darkrai; best-selling, Standard Size Poke Plush include Mudkip, Torchic, and Wailmer. “Large Size” stand an average of 10in tall and also come in Poke Doll and Poke Plush variations, featuring some characters not available in the Standard Size line: Blazikin, Charzard X & Y, and Garchomp, for example. Lastly are the “Trainer Size” or “Extra-Large” Pokemon plushies. These can range from 13in-21in tall, depending on the Pokemon, and are made to be extra soft and cuddly. Popular plush in this size include Meowstic (male and female versions), Delphox, and (just in time to celebrate his addition to the latest Super Smash Brothers Wii U video game) Greninja. Want to take your favorite Pokemon with you on the go, but need your hands free? Then the Pokemon Center plush keychains are just right for you! With over twenty-five different Pokemon available in cute, chibi form, you can feature a different Pokemon on your backback, suitcase, key-ring, belt-loop, or anywhere else you like, for almost an entire month! Plush Keychains include Pikachu, Lucario, Gardevoir, Hikozaru, and Drifloon. 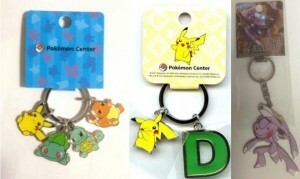 If plush keychains aren’t your thing, the Pokemon Center offers a wide variety of metal and plastic keychains, released every year, for your fandom needs. Metal keychains feature characters such as Genesect, Xerneas, and Yveltal. Another popular series features Pikachu, coupled with each letter of the alphabet, allowing collectors to purchase the first letter of their name (or even spell their entire name in colorful, Pokemon-themed letters). Yet other special keychains feature four separate characters on one ring. The possibilities for customizing your gear are nearly endless. Choose a stylish, limited-edition Pokemon Center bag for your next Con, school, work, or travelling experience, and show the world your love for the Pokeverse. Whether you need a pen bag, dice bag, tote bag, or shoulder bag, the Pokemon Center has you covered. Considered some of the rarest Pokemon Center items of all time, these limited-edition Pikachu, Eevee, Charizard, Groudon, Kyogre, and X & Y-themed Nintendo 3DS gaming systems each sold out within minutes of their release, remaining on store shelves for only a of couple days. The Pikachu 3DS is widely hailed as the rarest of the bunch, as it was sold only as a pre-order exclusive over a short period of time. Today, it is considered a pricy item worthy of true collectors only. This line of merchandise comes in commemoration for the winter 2014 opening of the newest Pokemon Center in Mega Tokyo. The Pikazard line combines the iconic adorableness of Pikachu with the fierceness of Charizard Y, featuring keychains, pins, outdoor bags, figurines, a music box, and, most popular of all, a must-have Pikazard plush that comes in two variations—smiling Pikachu face and snarling Charizard face. 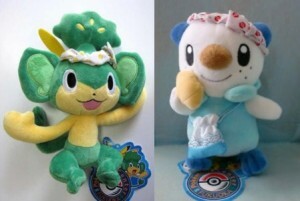 These Oshawott and Pansage plushies commemorated the grand reopening of the Pokemon Center in Fukuoka, Japan. Soft, rare, and absolutely adorable, they make an ideal addition to any serious collector’s shelf and are considered exceptional pieces of Pokemon merchandise. In 2013, a line of Shiny Gold Magikarp merchandise was released exclusively at the Nagoya Pokemon Center to celebrate its moving location. Among this much-coveted selection is an 8in Shiny Gold Magikarp plush toy, a ceramic Pikachu and Magikarp bank, and an enormous, life-sized, 36in Gold Magikarp plush. Three exclusive plushies were sold at the grand opening of the Pokemon Center in Tohoku: Pikachu with Effort Ribbon, Victini with Soothe Bell, and Snivy with Muscle Band. These particular plushies were never sold at any other Pokemon Center store, making them incredibly rare (and pretty expensive, too).